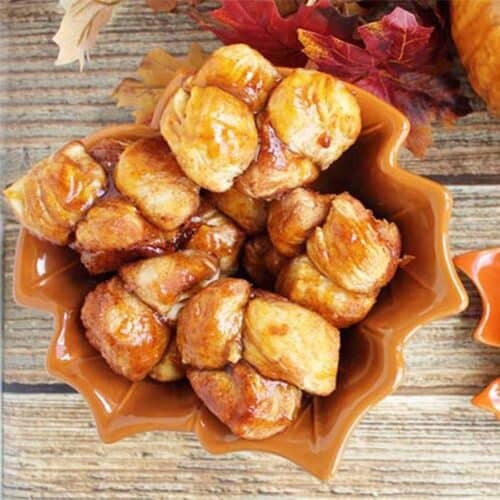 Monkeys and kids love to pull apart these gooey caramel monkey rolls flavored with pumpkin. They're quick and easy and a hit at breakfast every time! Heat oven to 350 degrees. Spray a 12-cup muffin tin with non-stick spray. In a large resealable bag, mix together sugar, cinnamon, nutmeg, allspice and cloves. Open the can of biscuits and separate into 8 biscuits. Using a scissors, cut each biscuit into quarters. Drop into resealable bag of spiced sugar and shake to coat. Place 4 pieces into each of the muffins cups. In a small sauce pan, mix brown sugar, butter and pumpkin puree together and bring to boil. Cook for 1 minute, stirring constantly. Pour half of the caramel sauce over the rolls. Place in oven and cook for 15 minutes or until nicely browned. Remove to wire rack and let cool just slightly. Remove rolls from muffin tin and place on plate. Drizzle with remaining caramel sauce and serve.